As he promised in the run-up to his inauguration, President Trump has sent a donation to the Treasury Department to make up for the controversial profits his private firm gained from foreign government guests staying at his luxury hotel just blocks from the White House. “I can confirm receipt of the check,” a Treasury spokesperson told Government Executive on Thursday. But neither Treasury nor the Trump Organization would say how much money was donated, from which countries the foreign visitors came, or how the profits were calculated. On Monday, the Associated Press was told by Trump Organization Executive Vice President and Chief Compliance Counsel George Sorial that the donation was made on Feb. 22 and includes profits from Jan. 20 through Dec. 31, 2017. The company’s 2012 lease of the historically protected Old Post Office Building from the General Services Administration became controversial after Trump won the presidency. 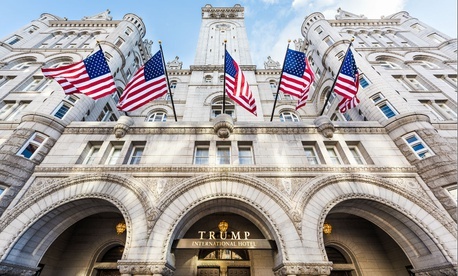 The unprecedented dual role as chief executive and tenant prompted an array of lawsuits claiming unfair competition with neighboring restaurants and possible violation of the Constitution’s foreign Emoluments Clause, which bars a president from accepting expensive gifts from foreign governments. Trump’s solution, announced during the transition period, was to place his vast business interests in a trust run by his family and to donate the profits from foreign hotel guests to the treasury. Neither the Trump Organization nor Trump’s Washington attorney, Sheri Dillon of Morgan Lewis, responded to inquiries.